In the face of ever-increasing casualties, the French army's ability to refill the ranks of all of its regiments became impossible. This attrition was however coupled with the structural reorganization of the infantry, with an gradual rise in firepower within the squad and section. In total, 187 units are dissolved during the war, the vast majority of which are reserve regiments. The most significant milestone in the dissolution of these units was a direct result of the appalling losses suffered in the first half of the Battle of Verdun in 1916: 43% of the 51 units disbanded in the summer of 1916 had just come from the Verdun sector prior to their disbandment. 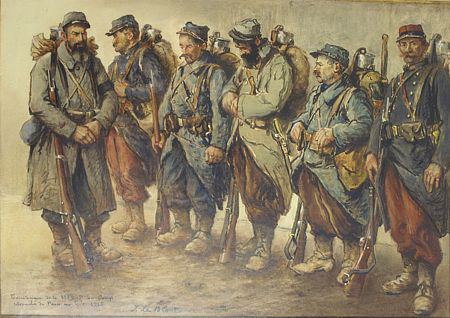 The remaining men of the units were typically transferred to other regiments to continue out the rest of the war. In the first year of the war, only a few units would have this fate. The 145 line regiment and its reserve sister unit, the 345, were the first to be dissolved. In September 1914, these two units occupied the fortified place of Maubeuge. After suffering significant losses during the siege from the German artillery bombardment, the two units surrendered on 7 September and effectively ceased to exist. These regiments were never subsequently reformed. The next dissolution would not occur until June 1915, when the survivors of two heavily exhausted reserve regiments (301 and 357 RI) were mustered out, followed by another two in December 1915 (280 and 284 RI). The remaining men would be transferred en masse to other units. These dissolutions also signaled the change in organization of large formations in the French army. For example, the 301 RI, after suffering serious casualties at Eparges was dissolved on 12 June 1915. The 5th Battalion was transferred to the 317 RI to act as its new third battalion, while the 6th Battalion to act as the third battalion of the 315 RI (both being designated as the 4th Battalion). The year 1916 would see a great many more units disbanded, 51 regiments in total, all reserve units save one active regiment (111 RI, after being overwhelmed at Verdun). Again, ever-increasing casualties and a lack of replacements to fill the gaps were a primary factor. This attrition was however coupled with the structural reorganization of the infantry, with an gradual rise in firepower within the squad and section. The change began in 1915 with the increasing incorporation of hand grenades into combat tactics, followed soon after by the trench mortar, rifle-machine gun, and rifle-grenade. Thus, greater firepower and more autonomy with less men. In 1916, the composition of French divisions are gradually reduced from four regiments to three, and then by the dissolution of the brigade. While some reserve regiments were broken up to bring all infantry regiments up to the three-battalion composition, others were turned into divisional infantry units. Another 35 reserve regiments were dissolved in 1917 and finally, 32 more following the massive losses incurred during the spring German offensives. In closing, it should also be noted that a majority of territorial regiments were disbanded between August 1917 and August 1918. Typically, the battalions were kept in tact and converted to pioneer battalions bearing the same regimental designation. These were either assigned to a designated infantry division or in some cases remained autonomous. Alternately, the men might be transferred to other units (line regiments or other territorial units). In the case of the machine-gun companies, these were often converted into "positional" machine-gun companies assigned to a specific sector or fortress. The following is a listing of all active and reserve infantry regiments dissolved during the war. Owing to large number of territorial units dissolved and converted primarily in 1918, a sampling of units has been provided. Following the unit designation is the date of dissolution/conversion followed by a descriptor. 211 RI – 16 April 1916 – one battalion transferred to 214 RI and the other to 220 RI to become the 3 Bat. 244 RI – Oct. 1916 – men transferred to 371 and 372 RI to become the 3 Bat. 250 RI – June 1916 – men transferred to 307 and 308 RI to become the 3 Bat. 257 RI – 20 June 1916 – men transferred to 212 and 344 RI to become the 3 Bat. 259 RI – April 1916 – men transferred to 283 and 288 RI to become the 3 Bat. 263 RI – June 1916 – men transferred to 278 and 338 RI to become the 3 Bat. 266 RI – 21 April 1916 – men transferred to 277 and 335 RI to become the 3 Bat. 271 RI – 10 June 1916 – men transferred to 247 and 248 RI to become the 3 Bat. 275 RI – 1 June 1916 – men transferred to 240 and 261 RI to become the 3 Bat. 282 RI – 1 June 1916 – men transferred to 204 and 289 RI to become the 3 Bat. 284 RI – Sept. 1917 – men transferred to 45, 84, 260 RI, and 58 BCP to become the 3 Bat. 285 RI – Dec. 1915 – on battalion transferred to 256 RI and the other to 295 RI to become the 3 Bat. 286 RI – 1 June 1916 – men transferred to 252 and 339 RI to become the 3 Bat. 292 RI – 28 June 1916 – men transferred to 298 and 305 RI to become the 3 Bat. 301 RI – 12 June 1915 – one battalion transferred to 315 RI and the other to 317 RI to become the 3 Bat. 302 RI – 1 June 1916 – one battalion transferred to 311 RI and the other to 312 RI to become the 3 Bat. 304 RI – end of June 1916 – one battalion transferred to 203 RI and the other to 341 RI to become the 3 Bat. 309 RI – 1 June 1916 – one battalion transferred to 217 RI and the other to 221 RI to become the 3 Bat. 310 RI – June 1916 – one battalion transferred to 208 RI and the other to 273 RI to become the 3 Bat. 314 RI – 21 April 1916 – one battalion transferred to 232 RI and the other to 325 RI to become the 3 Bat. 316 RI – 15 June 1916 – one battalion transferred to 264 RI and the other to 265 RI to become the 3 Bat. 318 RI – June 1916 – one battalion transferred to 219 RI and the other to 262 RI to become the 3 Bat. 323 RI – June 1916 – one battalion transferred to 216 RI and the other to 234 RI to become the 3 Bat. 336 RI – June 1916 – one battalion transferred to 202 RI and the other to 225 RI to become the 3 Bat. 349 RI – June 1916 – one battalion transferred to 358 RI and the other to 370 RI to become the 3 Bat. 353 RI – June 1916 – one battalion transferred to 346 RI and the other to 356 RI to become the 3 Bat. 353 RI – June 1916 – one battalion transferred to 294 RI and the other to 355 RI to become the 3 Bat. 357 RI – June 1915 – men transferred to 297 and 359 RI to become the 3 Bat. 362 RI – 31 Jan. 1917 – one battalion transferred to 324 RI and the other to 365 RI to become the 3 Bat. 364 RI – 24 Aug. 1916 – one battalion transferred to 303 RI and the other to 330 RI to become the 3 Bat. 368 RI – 5 June 1916 – one battalion transferred to 367 RI and the other to 369 RI to become the 3 Bat. 373 RI – June 1916 – men transferred to 229 and 363 RI to become the 3 Bat. 419 RI – Aug. 1916 – men transferred to 236 and 319 RI to become the 3 Bat. 420 RI – Aug. 1916 – men transferred to 329 RI to become the 3 Bat. 25 RIT – Aug. 1918 – two battalions become pioneer battalions attached to 33 CA, another element forms a machine-gun company and is attached to 1 US ID. 55 RIT – March 1918 - three youngest classes transferred to active regiments, remaining elements become 1 Bat. de Pionniers / 55 RIT, two companies become positional 79 and 80 Cos. de Mitrailleuses / 500 RIT. 63 RIT – 12 Aug. 1918 - 1 and 2 Bats. become Bats. de Pionniers, Cos. de Mitrailleuses incorporated into other positional mitrailleuse cos.
65 RIT – Jan. 1918 - 1 Bat. transferred to 1 DCP, 2 Bat. to 63 DI. "Le Fin de l'Armée des 173 Régiments d'Infanterie." Michaël Bourlet. 14-18 Magazine. août-septembre-octobre 2010. No. 50.